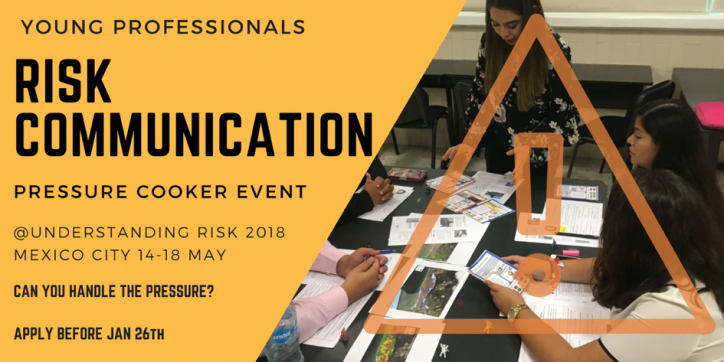 Are you interested in risk communication? Are you an early career scientist looking for the next challenge? Don’t miss out on this opportunity! The challenges surrounding risk communication are vast. How can the ever increasing amount of scientific information and technology be harnessed to inform local decision-making to reduce and manage natural hazard risk? Can the young generation of today bridge this gap to develop meaningful and tailored risk communication solutions for local decision makers and the general public? What innovative solutions can young professionals and students from different disciplines co-develop when put under pressure? The 2018 Understanding Risk Forum is hosting an intensive one-day (24 hours) “pressure cooker” event, during which interdisciplinary teams will test their innovative, creative, scientific and technological skills to co-develop risk communication solutions to real world challenges facing local decision makers. The “pressure cooker” is aimed at young professionals and students (under 35) and mentors in relevant fields. This one day event (24 hours) will host up to 20 young professionals and students divided into interdisciplinary teams to test their innovative, creative, scientific and technological skills to co-develop risk communication solutions to real world challenges facing local decision-makers. The teams will receive support and feedback from mentors and experts throughout the day (and night!). The solutions will be judged by a panel of experts and local decision makers, and the winning solution will be showcased as part of the UR2018 Forum. This event is aimed at young professionals and students (under 35) and mentors in relevant fields, and will host up to 20 participants. If you meet these criteria and are interested in applying either as a participant or as a mentor, please see the information below. Some funding is available for travelling. Interested applicants under the age of 35 can apply online by filling out the form at https://goo.gl/forms/ND8oejNmiS5I6km03. Please submit your application before Friday January 26th, 2018. Successful candidates will be notified before February 25th, 2018. For more info about the event click here: https://goo.gl/Z7eYQx. The event is organized by GFDRR, the Water Youth Network with financial support from the UK Natural Environment Research Council (NERC) and FM Global.